I was born the same year as Dolly the sheep, Michael “Prince” Jackson Jr., and the McCaughey septuplets. Among the people not alive during my lifetime are Princess Diana, Mother Teresa, and Jacques Cousteau. Since I was born, Hong Kong has always been under Chinese rule, and The Lion King has always been on Broadway. Born in 1997, I’m part of the youngest generation, the newest generation, Generation Z, which is categorized as all individuals born between 1995 and 2010. And this means I’m the subject of James Emery White’s new book, Meet Generation Z: Understanding and Reaching the New Post-Christian World. It’s a thoroughly researched analysis of a rising generation of globally connected, technologically savvy, strategically ambitious, passionately driven, and religiously confused individuals. 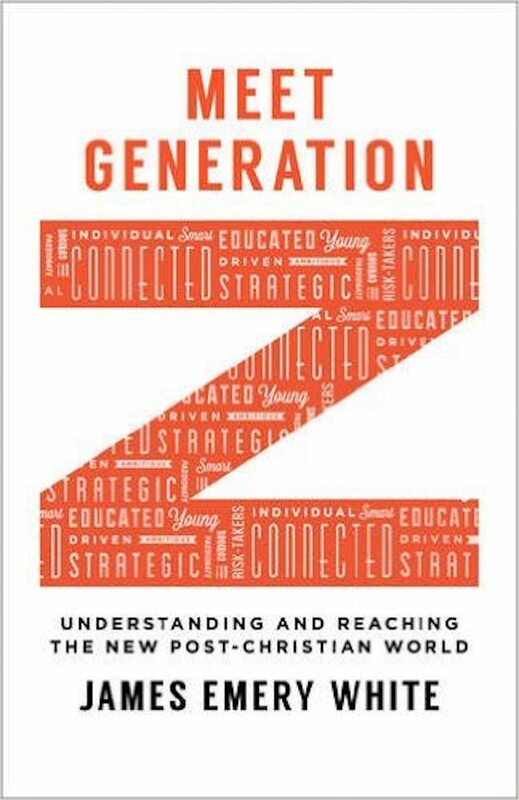 According to White, Generation Z is defined by five factors: (1) recession-marked—growing up in a post-9/11 world; (2) Wi-Fi-enabled; (3) multi-racial; (4) sexually fluid; and (5) post-Christian. In his first three chapters, White draws from his own research to assess this generation and the general condition of their spirituality. In broad strokes he paints a picture I’m all too familiar with—America’s first post-Christian generation. According to White, “Most people of Generation Z still believe in the existence of God (78 percent). But less than half attend weekly religious services of any kind (41 percent), and only 8 percent would cite a religious leader as a role model” (49). As a result, we’re spiritually illiterate, the first generation raised without “even a memory of the gospel” (64). White calls Generation Z “lost” and “leaderless.” We’re raised by a self-directed model of parenting in a hyper-sexualized world, meaning Generation Z grew up faster and lost their innocence sooner than any other generation. And now we’re facing a dynamic world hopelessly confused about God, church, morality, and faith. How Should the Church Approach Us? The final four chapters of Meet Generation Z focus on how the church can remodel their missional approach to better engage my generation. White begins with a basic overview of ecclesiology and the importance of the local church in reaching the lost. He defines the voice with which the church must speak as “prophetic”—warning, calling, pointing people to Scripture, yet in a careful and sensitive manner. He invites us to reconsider our evangelism and apologetic attempts in the face of a generation who thinks, questions, and reasons in a unique way, and to create a church experience that attracts and accommodates the seekers. Baker Books. 224 pages. $17.99. Cultivate a culture of invitation. White also includes three appendices on homosexuality, the supernatural, and the existence of God. There’s much in Meet Generation Z to learn from. White’s research is sharp and relevant, and it hangs heavy with responsibility for churches who wish to biblically engage contemporary youth. Any Christian desiring to better understand our changing culture would benefit from his insight. This church model he advocates for sounds reminiscent of Robert Schuller’s “felt-needs psychology”—the belief that, to reach the unsaved, we must go and figure out what they think they need and then give it to them. He wants the church to become like the culture to reach the culture. The majority of White’s practical suggestions for cultural engagement (e.g., rethinking evangelism, apologetics, worship, children’s ministry, music, and mission) all seem to stem from this belief. Flowing from this belief is the idea that we should restructure the Lord’s Day gathering. Instead of being primarily for believers, White argues it should be specifically tailored to attract and entertain the unsaved: “The weekend service should be, at least for now, the front door of the church for outreach. As a result, it should be crafted optimally for that outreach. That means it is not crafted optimally for discipleship” (152). Statements like that are fuzzy. I wholeheartedly believe that the church has a significant responsibility to engage the culture (how else can we fulfill the Great Commission? ), but not by changing its worship to make searchers and seekers more comfortable. When I think about what my generation needs, that’s not it. You might get us in the door because of free pizza, Bible stories told in emojis, or your radically fun children’s ministry, but at the end of the day our spiritual hunger is not satisfied by what’s “cool” or relevant. We don’t need modern music, hipster clothing, or hilarious preachers. Those things aren’t necessarily bad (though they might be), but they don’t have the power to tap into Generation Z’s heart and effect permanent change. We need what every generation needs—Millennials, Boomers, Gen X-ers, and everyone in between: to hear the truth preached. Yes, make your church culture welcoming and inviting to young peopl,e but make a bigger effort to simply communicate the gospel to us and allow us into community. Reaching Generation Z is important. White and I agree. But just as important is how we reach them. White argues for a “new approach,” a missional model that, I believe, is so focused on reaching the culture that it promotes a problematic method. In doing so, the book also misses the opportunity to emphasize the need for ongoing discipleship of saved members of Generation Z—like me. We’re the youngest generation of Christians, and the first living in a post-Christian world, which means we deeply need the church to help strengthen our faith. If the church is hyper-focused on the seeker, we’ll miss out. As part of Gen Z, I say yes and amen. Jaquelle Crowe is the author of This Changes Everything: How the Gospel Transforms the Teen Years (Crossway, 2017). She’s also the co-founder of The Young Writers Workshop and lives in eastern Canada. You can follow her on Twitter.